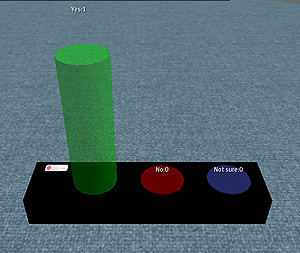 The voting system is an interactive teaching and learning tool. With this tool, you can gather instant feedback from students and discuss the result with them in class. This can arouse students' interest in having virtual lessons in Second Life. The default setup provides three options: "Yes", "No" and "Not sure". If you would like to use this tool in class, you will need to make a booking with us 2 weeks before your class and tell us where you would like the tool to be placed, as well as your Second Life name, so that only your account can reset the tool for each question. Advanced modifications of the tool (colors, numbers of choices, etc.) should be requested 3 weeks before class. bar based on their choice. The three bars' height will show the voting percentage instantly. To reset the system to its initial state after each round of voting, you need to press the white button at the top left top corner of the base unit. Please note that there will be no record of choices for previous questions once you reset it. The voting system can help you to collect students' INSTANT feedback.